Gutters from ABC Seamless of Albuquerque will add beauty and functionality to your home in Grants, New Mexico, or a surrounding area. 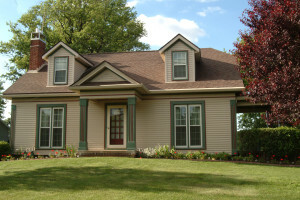 In business since 1989, we specialize in custom fabricating seamless steel siding and gutters to perfectly fit your home for enhanced functionality and beauty. And, because we have proudly served the Southwest for so long, we understand the unique needs associated with having a flat roof, a common feature in the architecture of the area. Thankfully, the seamless gutters that we offer will minimize the opportunities for leaks to develop and because they are 30 percent larger than standard gutters, they will be able to more effectively direct rainfall away from your home. We stand behind the work our installers perform so much so that we offer a lifetime warranty on all of the products that we install in addition to the already outstanding manufacturer warranties that we offer to homeowners. For more information about the durable gutters available to homeowners in Grants, NM, or a surrounding area, contact ABC Seamless of Albuquerque today. Alternatively, feel free to stop by our luxurious showroom to see our products in person.